There will always be a cut throat competition between Windows and Android platforms, more so with the launch of new smartphones in the market at a rapid speed. The latest to hit the market and rule the rooster are Nokia Lumia 1020 and Samsung Galaxy S4. A lot has been said about these two phones boatsing of superior user experience. However, while some prefer Nokia Lumia and others Samsung S4, there is also a chunk of the population that is unable to make up its mind as to which phone will suit them more. Therefore, a comprehensive list has been compiled that talks about definitive features and the corresponding phone that leaves a mark in that territory. 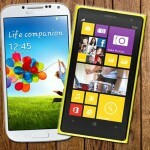 Both the Nokia Lumia 1020 and the Samsung Galaxy S4 are humongous in size. While this is not essentially a drawback, it does, however, pose a problem for people who may not have large hands to accommodate the phones. Nonetheless, the Samsung Galaxy S4 can be considered a viable option as it is comparatively lightweight and boasts of a thinner frame but when you compare it with the alluring structure of the Nokia Lumia 1020 combined with its durability, you may give Samsung Galaxy S4 a second thought. The design and durability of the phone is likely to be rendered useless if a phone does not provide the functionality that it was designed for. Therefore, it is important to take into consideration the processor that goes into its making and the memory that it boasts of. Nokia Lumia has a dual core processor of 1.5GHz Qualcomm Snapdragon S4 Plus and an internal RAM memory of 2GB. The Samsung Galaxy S4 on the other hand, boasts of a quad-core 1.9GHz Qualcomm Snapdragon 600 processor with the same amount of internal RAM memory of 2GB. While both have different processor systems, they are equally competent. Nokia Lumia 1020 can store data up to 32 GB while Samsung Galaxy S4 boasts of only half of the data space. The Galaxy S4 took a slight dip in sales last month but it’s still one of the most popular devices on the market right now. It is a known fact that Nokia Lumia 1020 boasts of the Windows 8 whereas the Android 4.2.2 Jellybean is the platform for Samsung Galaxy S4. While both are competent, Samsung Galaxy S4 has an upper hand over Nokia Lumia 1020’s dynamic live tiles of varying sizes. This is because Samsung Galaxy S4 is far more interactive and boasts of superior features like Air Gestures, Smart Scroll, Air View, Smart Pause and many more. When it comes to the display, both Nokia Lumia and Samsung Galaxy are competent, however, the graphics and the sharpness provided by the 5 inch super AMOLED display by Samsung galaxy S4 is hands down the better one compared to Nokia Lumia 1020’s 4.5-inch PureMotion HD+ display coupled with the ClearBlack AMOLED. To put it simply, Samsung galaxy S4 consists of a much higher resolution of 1080 x 1920 as opposed to Nokia Lumia 1020’s 768 x 1280. While Nokia Lumia 1020 may be known for its superior ability to capture images in low light, it does not necessarily give Samsung Galaxy S4 a run for its money as both are equally competent. Nokia Lumia 1020 has a myriad features that you would otherwise find in digital cameras for shooting an image. However, for superior quality images, you are required to download an app called the Nokia Smart Cam app whereas all the features that you need to click photographs are easily available in Samsung Galaxy S4. Stella Corrine is a technology geek and a blogger. She is self employed and loves to review products ranging from beauty products to restaurants and even smartphones and tablets. She is an avid reader and loves to read magazines on varied topics.